Do you remember Parax 0-99 counter (Chain precession drive mechanism) shown here at TBs , last February? Well... Shaun Sullivan have now designed a similar device, though a different mechanism. 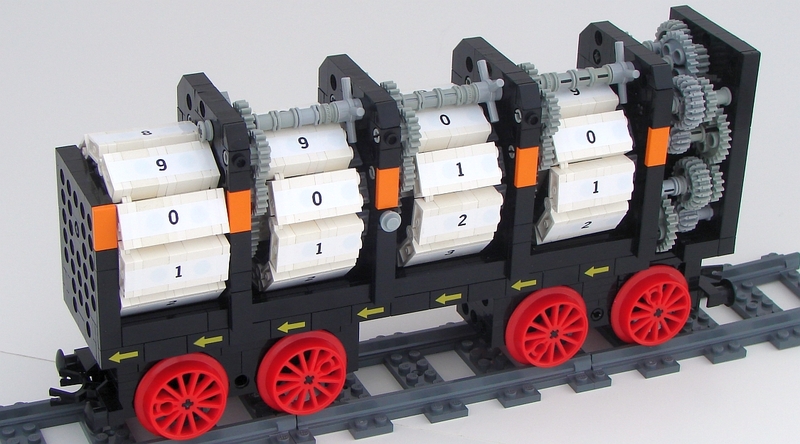 A LEGO Train Odometer (LEGOdometer) that's able to measure distances up to 99,99 miles. The propose of LEGOdometer is to measure the distance a train travels in a layout during one event and it is calibrated to give real measures, with an error smaller than 8 feet/mile. The principles are different from those used at the time by Parax, and you may find them described through a nice reading, from Shaun's announcement at LUGnet. There he describes with extensive detail, the goals, the conception and design process as well as the simulation methods used for calculations and to achieve the most effective packaging reduction for the gear train which ensures that each 1/100 mile the BBB train drive wheels run, corresponds to one digit step on the lowest LEGOdometer dial. For the complete serie of photos, take also a look at the respective BS folder. To me, the most admirable thing, besides obviously the concept itself, is the enormous work required to determine and position all those gears!